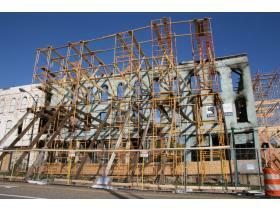 Ypsilanti Fire Chief Jon Ichesco notified property owner Stewart Beal he remains under order to abate the Thompson Building, citing the temporary scaffolding in place is not permanent stabilization. Nov. 24, 2009 · 3:27 p.m.
Assistant City Attorney Karl Barr said he would most likely be filing in circuit court mid-December to abate the Thompson Building at 400 N. River Street. The city sent a notice of abatement to Stewart Beal, the property owner, Nov. 9 requesting the structure be demolished or permanently stabilized and secured from danger of collapse. In a brief response to Ypsilanti Fire Chief Jon Ichesco, dated Nov. 13, Beal wrote his company has fulfilled the order to stabilize the structure. However, Barr said a temporary stabilization in the roadway does not suffice for permanent stabilization of the structure. Beal was given temporary approval to occupy the roadway for 90 days and set up scaffolding to support the remaining structure shortly after it was engulfed in flames in the early morning hours of Sept. 23. Both the east-bound lane of Cross Street and north-bound lane of River Street have been closed since the fire. In a letter sent Monday from Ichesco, Beal was notified he remains under order to abate citing the scaffolding is not permanent stabilization. “Your letter dated November 12, although pleasant in its terms, conveys to me that you will not be taking any further action to comply with my order,” Ichesco wrote. Ichesco also touched on the fact that Beal’s response to the abatement does not mention any ban or roadblocks that would keep Beal from complying with the abatement. An investigation into the cause of the fire is still underway. Ichesco said last week the Michigan State Police acknowledged it has received samples from the Ypsilanti Fire Department to be analyzed and expects results to come through in a month or so. Beal did not immediately return a call made to him asking for comment.